Or, the guy spewing some tired, tired lines. Four years ago Tom Cruise pissed off Lee Child fans when he put on the rumpled jeans and tee of the 6’5” drifter with mad military skills. 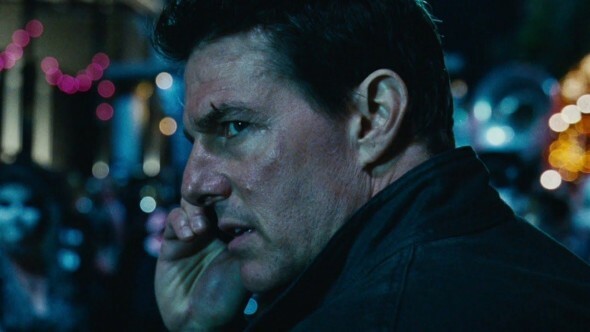 In the serviceable thriller Jack Reacher, Cruise’s character puzzled through a homicide set up with the help of an inappropriately dressed defense lawyer. Nowadays, though, maybe Jack is subconsciously looking to settle down. He meanders back to DC to talk with the Major who is now in command of his old post – the overtly fierce Samantha Turner (Cobie Smulders). Sparks? Well, there might have been except Major Turner’s been incarcerated, there’s a highly trained sociopath with an alpha complex and a fancy pair of leather gloves, and an at-risk teen is in need of guidance. The action’s far less interestingly choreographed, the humor is nonexistent, the villain is far blander (it was Werner Herzog last go-round, for lord’s sake!). With the right combination of vulnerability, brattiness and savvy, Danika Yarosh provides the rare bright spot as the wayward teen. Smulder’s indignant badass is all but intolerable. Meanwhile, Cruise seems paralyzed as he tries to relay confused and conflicted paternal tendencies. Edward Zwick’s stale direction isn’t helping. The closest thing to panache comes by way of the now de rigueur chase across urban rooftops. Yawn. Incompetent plotting, weak catch phrases and a shocking lack of chemistry among any and all actors will keep a project from succeeding. Hopefully everyone involved – including the audience – can leave the film and never go back.